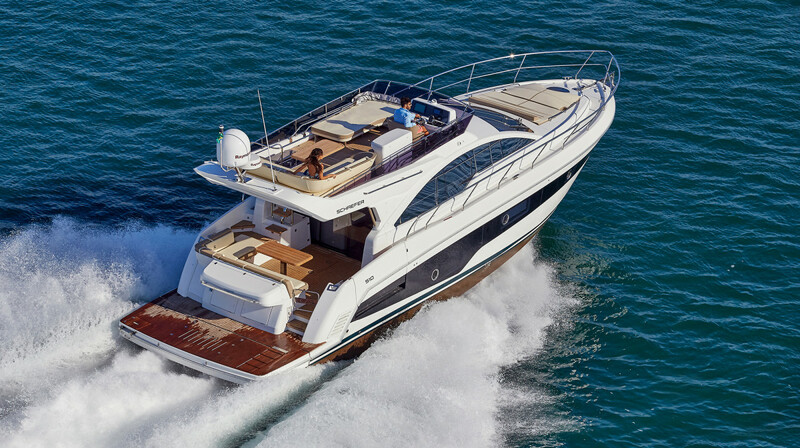 Utilizing Old World craftsmanship and modern innovations, the 510 Pininfarina is the best of both worlds. The 510 combines Old World craftsmanship with modern innovative touches, all wrapped up in a decidedly Italian design—even though its made in Brazil. 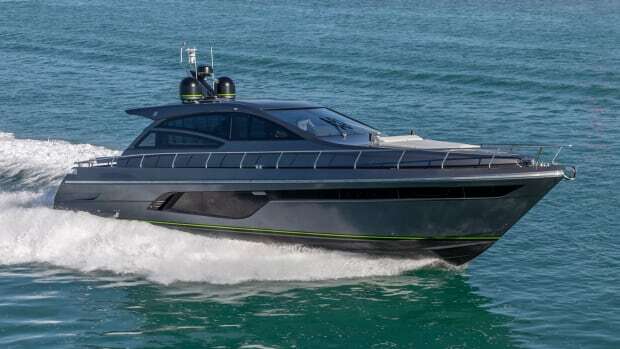 If you check out the new Schaefer 510 Pininfarina in a brochure or on the web, you’ll notice the boat’s designer is listed as Pininfarina/Marcio Schaefer, an order of appellation that gives primacy to one of the most prestigious design firms in the world. 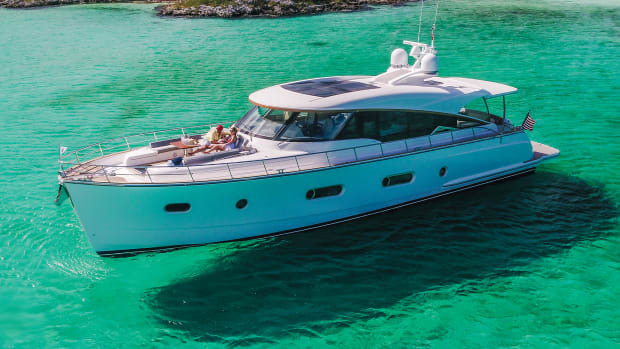 And I’d say this makes a lot of sense given that the visual aspects of Schaefer Yachts’ most recent launch are way more immediate than the details of her construction and engineering. 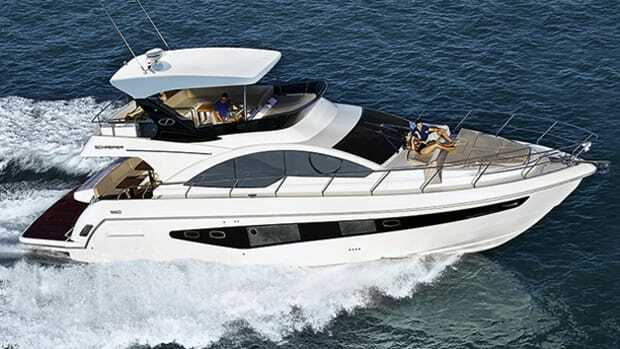 Indeed, when you go aboard the 510—as I did during last year’s Ft. Lauderdale boat show—what you notice first is an array of styling attributes that look decidedly Italian (although the boat is built in southern Brazil) but, more to the point, reflect the distinctly Italianate panache of Pinanfarina. 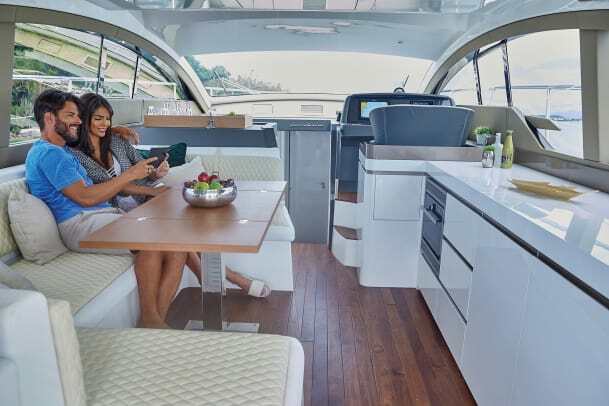 There’s more than a whiff of racy, luxurious elegance, for example, in the diamond-stitched leather upholstery (with polished-stainless fitments) that enlivens the 510’s salon as well as her three-stateroom, three-head layout belowdecks. Moreover, the off-white lacquer that enhances the effect is the real thing, with the multi-layer depth of Old World craftsmanship. And the fold-out balcony in the starboard cockpit inwale, as well as the folding stairway that arises like magic to service the cockpit sole when the hydraulic swim platform is lowered, only serves to expand upon the theme. 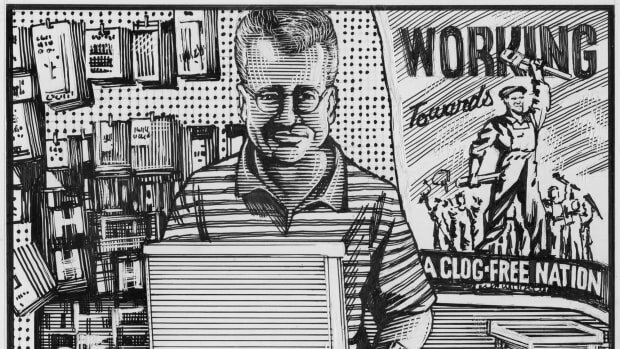 Such aesthetics, however, don’t preclude a wholly modern approach to technology. For starters, Schaefer uses the largest five-axis CNC milling machine in South America to develop the molds for the 510. 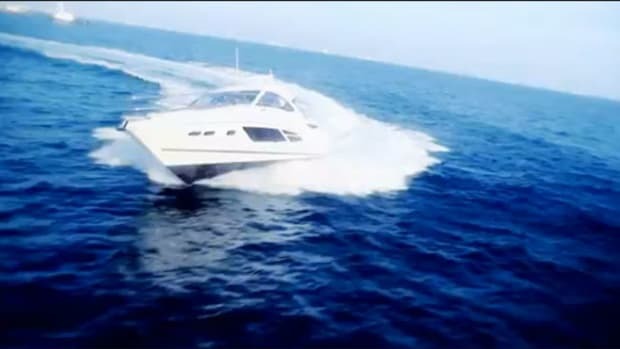 And then the company vacuum infuses all structural components (hull, stringers, decks, superstructure and flybridge) with vinylester resin, a material known to resist osmotic intrusion. If you lift the carpet that covers the 510’s salon sole, what you’ll find is a smooth layer of resin-infused fiberglass, not plywood or some other less-resilient surfacing agent. 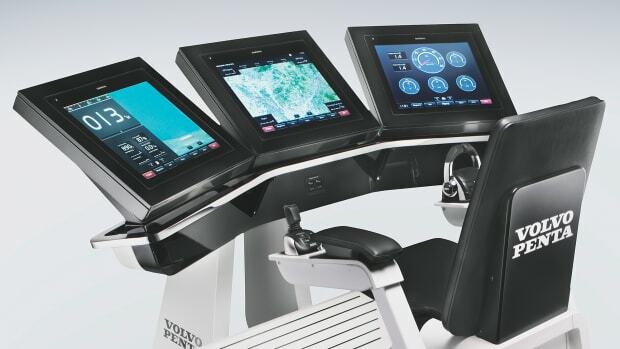 And finally, the Volvo Penta propulsion packages that Schaefer offers incorporate the latest in modern drivetrain engineering. 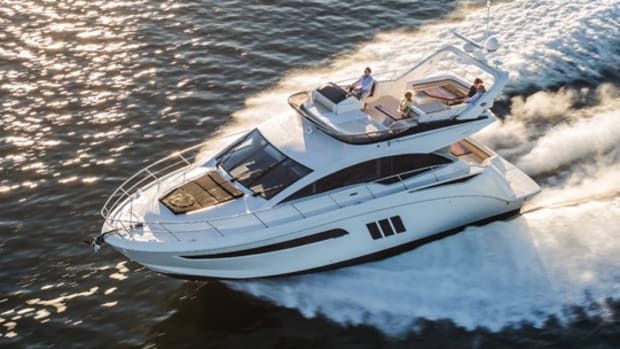 Whether you opt for a set of 435-hp Volvo Penta IPS600s on the low end of the horsepower spectrum or go with a pair of 600-hp Volvo Penta IPS800s on the high end, you’ll get all the pod-propulsion goodies. 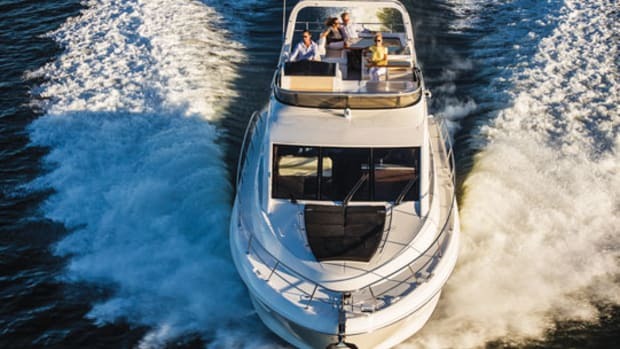 Two nifty features of the 510’s engine room deserve special mention. The first showcases a savvy idea I’d never seen prior to my tour of the boat. 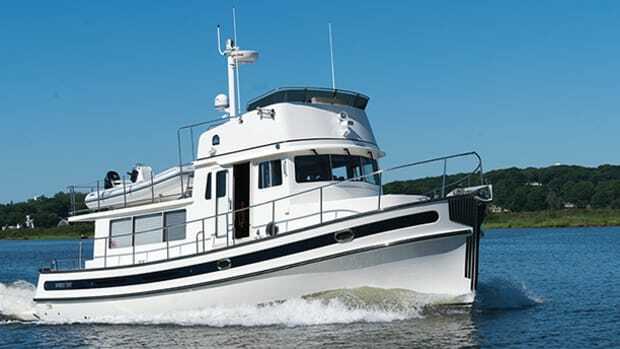 The forward ends of both engines are canted slightly, almost unnoticeably inward, a strategy that affords improved outboard engine access (as well as space for a 11.5-kW Onan genset) on the starboard side and room for a narrow, single-berth crew’s quarters to port. The second feature is perhaps less interesting but guarantees safe, easy maintenance access to both IPS units. Not only are the short jackshafts that feed the units shrouded for safety, but there’s plenty of headroom above to facilitate regular fluid checks and refills. 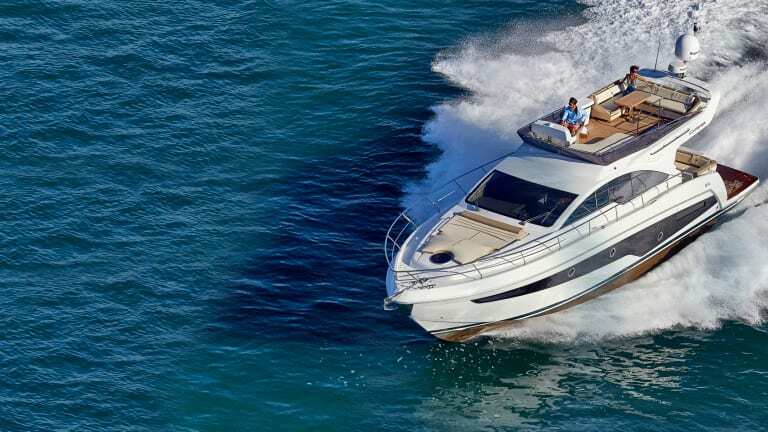 I might add that, based on my short boat show look-see, the Schaefer 510 Pinanfarina is an exceptionally stylish boat as well, albeit with a sturdy, contemporary essence.